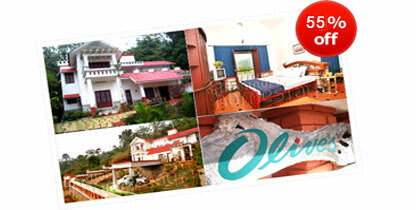 Stay for 01 Night & 02 Days per person at Olives Homestay Wayanad on a twin sharing basis in well appointed rooms. Well appointed Air Conditioned Room. Unlimited use of Hotel Aminities. Olives homestay is located amidst coffee plantation, about 1.5 kms away from the main town- Kalpetta, headquarters of Wayanad district. Despite its proximity to the town, the homestay retains a sense of peace and charm of countryside. On the first floor, it has three spacious and comfortable bedrooms, each attached with modernly equipped bathrooms for guests giving them their personal space. The décor of the house is inspired from both European and traditional Kerala architecture. The extended open verandah makes an interesting place for morning yoga exercises, cup of tea or long evening chats. The house has an extra kitchen where the guests can learn how to cook traditional Kerala cooking or even share their cooking style with the hosts. Olives Homestay has a well maintained garden and those interested can do some gardening, in the process learning more about the local flora. Step1 :- Click on Book Now Tab and Pay @99/- Per Person through Credit Card/Debit Card or Net Banking. Step 2 :- After receiving the vouchers, please call 0124-6749058, 063 between 10:30am to 6:00pm (On weekdays). Step 3 :- Pay the balance amount after confirmation. Step 4 :- The final confirmation will be sent to your email, please carry the printout at the time of travel. Booking is applicable on Twin Sharing Basis. Voucher is valid till 30th April 2011. Once the voucher is sold it is non refundable & Non Changeable. One voucher code will be applicable for only one person. Bookings are dependent on the Subject to availability with the hotel. If you have not decided yet or wants to customize tour itinerary or hotels listed above in "Book Olives Homestay Wayanad in Advance with Goibibo Rs.99/-", then we can change the travel itinerary and make a personalized, tailor-made holiday package, especially for you. We can modify this travel package as per your itinerary, budget, duration and the tourist places you would like to visit, including transportation and airfare should be included or not. Please fill the form below to contact us.